CAWP is a partner of the Wood Products Quality Council, a specialist body established in 1997 with the goal of assisting manufacturers to deliver ever-improving value to their customers, while improving overall efficiency and profitability of their operations. The WOODMARK Quality System was designed specifically for the wood products processing industry and focuses on the use of quality control tools to improve the consistency of product outputs and the efficiency of production systems. Unlike other quality programs that are heavily document oriented, WOODMARK places more onus on process measurement and total quality management to produce tangible and practical quality gains and accompanying cost savings, while being less onerours to implement than other quality management systems. CAWP can assist manufacturers to implement the WOODMARK system, by providing a technical specialist who can work with your company personnel to determine critical areas for improvement, help them set up the appropriate monitoring systems, reporting and communication structures, training, and other components. Implementation times will depend on your company’s quality goals and readiness in terms of current production practices and availability of personnel. The process begins with a comprehensive review of your company’s existing practices and ends with a third-party certification audit. The WPQC is working with a number of companies in BC, Alberta, Ontario and Atlantic Canada on certification initiatives, and many more are already certified. For more information on how WPQC might assist your organisation, please contact Jason Chiu. One of the biggest manufacturing issues that many RTA furniture companies face are problems in the drilling area. Incorrect sizing and distances with respect to dowel holes can cause many problems for the rest of the process especially when drilling is conducted early in the production. If components such as drawer sides, shelves or gables are incorrectly drilled, the result is final product that does not fit properly during assembly. If the manufacturer is fortunate enough to catch these drilling problems at final assembly then only internal costs are incurred. However, should this nonconformance reach the customer, the potential for greater cost increases significantly with respect to lost business and decreased customer satisfaction. Our case study takes place at a ready-to-assemble furniture manufacturer in Western Canada. The company is a leading manufacturer of high quality residential furniture that caters to the North American Market. As part of their newly developed quality program, several areas of the manufacturing plant were identified as ” critical areas “, which are those that are most significant to the quality of the final product. The need for minor improvements was recognized at the drilling department, which is one of the most critical areas in their entire process. Situated early on in the production flow, the drilling department incorporated informal quality spot checks that were randomly conducted in no particular pattern. This method of quality control was not very effective in catching many errors that were later detected in the process at the assembly department during final inspection. Assembly and final inspection was usually where the errors were caught because until that point, no further processing of the holes is required, therefore the onus is on the drilling department to ensure that the holes are 100% within required specifications.By the time the nonconforming components reached the final parts of the process, it is much too late to resolve the problem cost effectively. Repairs and rework can often times remedy the situation, however significant resources have already been invested in the manufacture of defective components. At the same time, if a large batch of components cannot be repaired then the result is wasted material, labour and machining time into components that will be rejected. It is difficult to put an accurate dollar value on the potential for loss with respect to improper drilling and the costs associated in resolving the problem. But imagine a batch of 500 drawer sides that have been drilled incorrectly and can’t be readily fixed. Your customer needs 500 complete RTA units at the agreed delivery time and you have allotted just enough lead-time to meet the order. Your dilemma now is – do you indicate to your customer that you will be late in delivery or do you halt production of other customer orders to run 500 replacement drawer sides to meet the deadline. This scenario has not even taken into account the wasted resource already invested into each component and this is just for one single customer order. Because of the potential for these types of problems, the company decided that improvements could be made in monitoring the consistency of the drilling department. More focus was placed on measurement and development of target and tolerance values for the operators to monitor. In addition to training, a formal acceptance testing program was developed by the in-house quality department incorporating a rigid sampling plan and data collection check sheets. By training the operators to understand the sampling program, they are better able to monitor their drilling machines and prevent errors in addition to being able to detect them. The premise of the newly developed control measures at the drilling station complimented the existing informal spot checking. A more intense sampling program involving the measurement and inspection of every 75th drilled component of a batch would be conducted using digital calipers. All holes are measured for diameter and depth as well as location and distance between holes. These values are then compared to required target sizes and tolerances set by the company or the customer. The measurements are then recorded on data check sheets, which can be used for further analysis. The result of these efforts is a 30% decrease in drilling errors at the drilling station, which translates to even fewer errors discovered at final assembly. The goal is to eliminate drilling problems altogether to avoid any unnecessary waste and rework in the future. As it was difficult to place a dollar value on cost of errors, so is it to place a dollar value on the potential cost savings from good quality control. 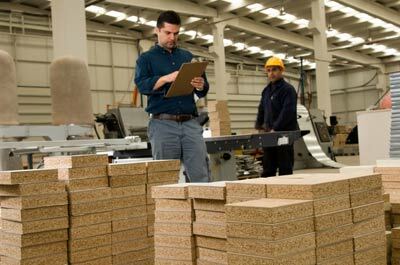 Written by Ken Wong, former Quality Certification Team Leader for the Wood Products Quality Council. This article first appeared in Woodworking Magazine, 2002.